Prior to the discovery of gold, the West Coast was home to Poutini Ngai Tahu who had a string of settlements along the Coast. 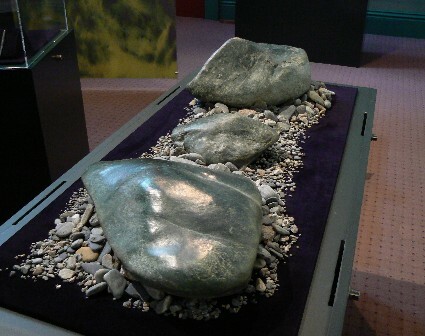 Maori collected and carved pounamu (New Zealand jade), a treasured stone which, because of its usefulness and beauty, was traded throughout New Zealand. The West Coast was occasionally visited by Europeans but had no permanent European settlers until after gold was discovered. Gold was discovered near the Taramakau river in 1864 by two Poutini Ngai Tahu pounamu hunters, Ihaia Tainui and Haimona Taukau. A European, Albert Hunt, publicised the find, claiming the discovery and reward for himself. Although the rush was slow to gain momentum when it was reported in early 1865 that 2,375 ounces of gold had arrived in Nelson from the West Coast the rush was on. At the end of 1864 the population of Maori and itinerant miners was estimated at 1800. Within two years there were 30,000 people on the West Coast. Hokitika grew quickly from a town of tents to one with impressive hotels (more than 100 of them! ), churches and smart wooden cottages. Gold mining remained important for many years although it was gradually supplanted by timber milling. More recently dairying and tourism have become important contributors to the West Coast economy. There is a lot to explore in Westland. To find out more about heritage walks in and around Hokitika have a look at Enterprise Hokitika's website.